Please feel free to post your opinion on one of the videos. Good evening teacher, thank you for the videos and the exercises, I found the videos from the 60's to the 90's very interesting and informative!! Personally, i believe that the 60´s and 70's were truly the years in which the world changed the most!! Change is a constant in our world and it is quicker as time goes by. hey teacher, thank you a lot for the videos, they were really interesting and helpful! Hi Teacher! I must say, those were some pretty interesting videos, and watching our whole history in such a short amount of time reminded me of how little we are, but of how much we've done. Neil deGrasse Tyson once said that if the history of the entire universe were a calendar, we would be the last second of the 31st of December, and even though I have that in mind, seeing how much we have evolved, both technologically and socially, makes me wonder how we will be at the end of the next second... Regarding the exercises I think they were simple but explanatory and will for sure help anyone interested in studying a bit more. I really enjoyed the videos that you posted, especially the one about the 1960s since it perfectly showed how different society was back then. The 60s are my favorite decade due to the Cold War, the women's movement, the Moon landing and, of course, the music, the fashion, the clothes, and the hairstyles. I am also very grateful for all the grammar exercises that you posted for us during this school year. Hi teacher! Thank you for all the videos and exercises for they were really helpful and entertaining. 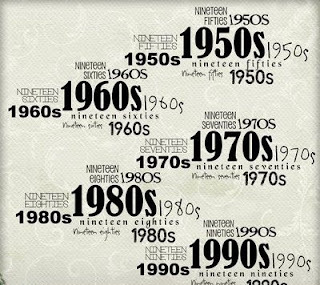 The decade which I find the most interesting is the 60's, as I believe it was the most world changing era. I really appreciated the four documentaries as well the first video. Only with two minutes we can recognized the huge development of our history! Thanks for the grammar exercises, they are extremely helpful for tomorrow!! I enjoyed a lot the first two-minute video. Despite being short, it sums up pretty well the main events and the evolution suffered throughout our history. Plus, the other four videos reflect each decade's spirit by selecting important occasions of each one.